Keep your top software developers stimulated and engaged by investing in professional development and making room for innovation. Developers are most satisfied when their work feels meaningful and technically challenging. Good managers know this — but knowing is only half the battle. It can be difficult, or downright impossible, to consistently funnel interesting work to your developers. Fortunately, even when you’re at the mercy of your project pipeline, there are ways to keep your team stimulated and engaged. When you first hire a new developer, they’ll experience a tremendous rate of learning as they work with new people, processes, tools, and development languages. But as new hires become more familiar with their work, the learning curve levels out. Projects that were once exciting can begin to feel routine and monotonous. Developers also gather a lot of domain knowledge when they’re new to a job. For instance, if a publishing company hires a new developer, they’ll learn about the operations and nuances of the publishing industry. Domain expertise grows steadily over time and is less likely to plateau. With every software release, there’s an opportunity to do future research on ways to improve with the next release. 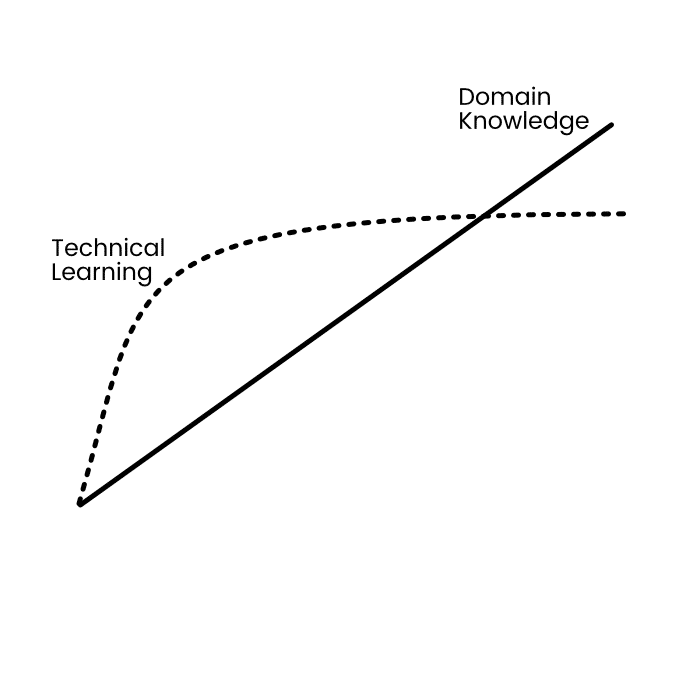 As you can see in the graph, developers often reach a point where they’re learning about the domain but not learning much, if anything, technically. This isn’t an issue for some developers, but others become dissatisfied with the lack of technical learning — which can result in a loss of interest in the product, the company, or their job as a whole. Recognizing and fixing the situation can be difficult. It’s important to get to know each of your developers individually and understand their career aspirations and work preferences. The best way to keep them engaged will depend on the kind of challenges that they’re seeking and goals that motivate them. Apple has Blue Sky, which allows workers to spend a few weeks on pet projects; LinkedIn has InCubator, a program that gives engineers time away from their regular work to develop on their own ideas; and Microsoft created The Garage, where employees can build their own products using Microsoft resources. Here at Very, we’ve adopted Google’s 80/20 rule to give developers the space and time to pursue their passions. Our developers work four days a week on client work, and Fridays are reserved for internal work, learning new tools, or pursuing pet projects. If you can’t allot that much time, think about hosting a hackathon or simply giving your team the freedom to explore different approaches to the “core” projects they’re working on. You may not have the flexibility to change the type of projects your team works on. When that’s the case, investing in professional development can make a huge difference in developer engagement and satisfaction. In fact, the 2017 Stack Overflow Developer Survey found that developers prioritize “opportunities for professional development” over any other factor — including pay — by a large margin. Professional development isn’t one-size-fits-all. Some of your developers might want to take on more leadership responsibilities, while others would rather expand their technical prowess by learning new frameworks or coding languages. That’s why it’s critical to understand what motivates each of your direct reports, then work together to create a professional development plan. Start by having each of your employees complete a values assessment like this one from Career Perfect. It captures feedback about your employees’ preferences and values. Do they like a fast-paced environment with a lot of change, or would they be more content to work on something they already know and love over the long-term? Which is more important — being recognized for a job well done or feeling like they’re making a difference? Of the projects you’ve worked, which ones make you most proud? What do you think your talents and skills are? What values are important to you? How can you apply those values at work? What projects, skills, or other responsibilities would you like to be a part of to develop your career? These talks will give you critical information about each of your employees, and the time spent together will build trust and indicate a genuine personal interest. “Stretch” projects in areas they want to pursue. Mentorship from another team member. Encouraging professional development not only keeps developers engaged, it also expands your company’s technical expertise.